Socialites and military-style fighters without peer, the Aspects of Fire are the shimmering embers of the Dragon-Blooded Host. Yet, these visionaries do far more than make love and war. With their incredible battle skills and their vibrant personalities, the Children of Hesiesh are the beating heart of Dragon-Blooded society and the driving impulse of its people. 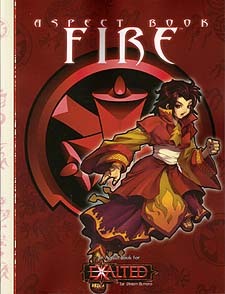 Aspect Book: Fire is the third Aspect Book for Exalted - books detailing the differing aspects of the Terrestrial Exalted. Within it lie the stories of five members of the aspect, for those who have just graduated secondary school to the mighty Cathak Cainan himself. This book also contains the new magical powers, rules and artifacts that Fire-aspected characters will need to claim their role among their people as advocates and master swordsmen.